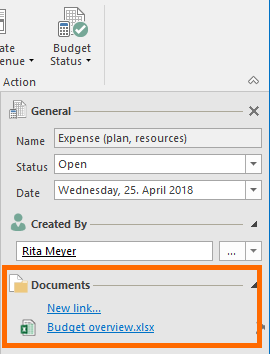 It is possible to attach an Excel table, a contract or any type of documents to project budgets or individual budget items. This enables you to establish better comprehensibility, e.g. for invoices. To attach a document, double-click on a budget or budget item. In the side panel, click on New link under Documents. In the dialog box, select the document from the list of existing project documents. You can also search for a specific document (e.g. 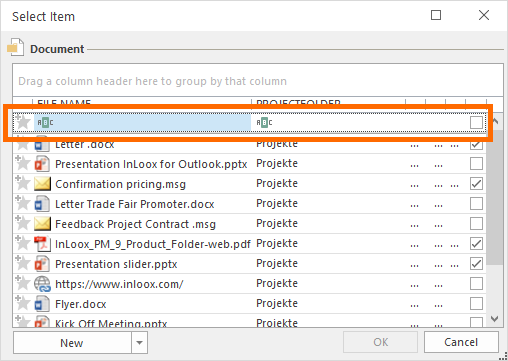 by file name) by typing your query in the bar above the respective column header. You can also click New to upload a new file (New file), link to a new file or add a new internet URL. Link documents to budgets/budget items | Inloox for Outlook Help • Copyright 1999-2019 © InLoox, Inc. All rights reserved.